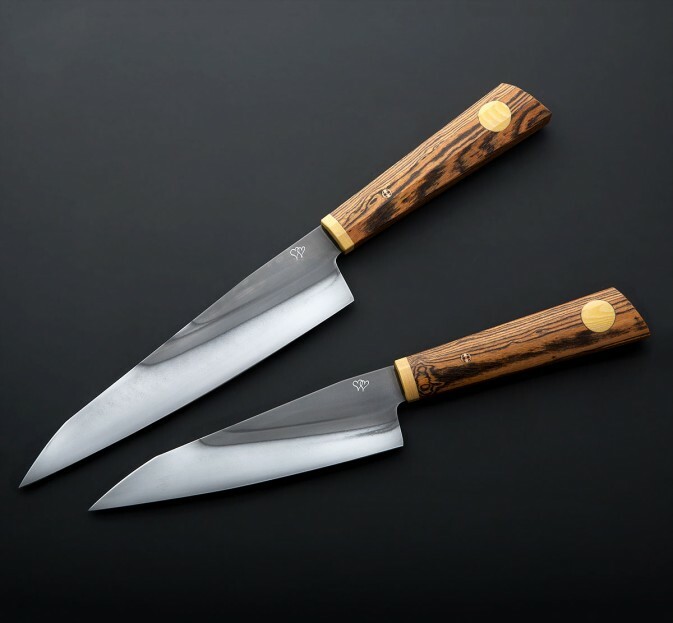 Engraved with interlocking hearts, Don Carlos Andrade creates an exquisite chef knife set dressed in bocote wood with etched, polished 1095 carbon steel blades featuring beautiful hamons, a result of the precise hardening process. 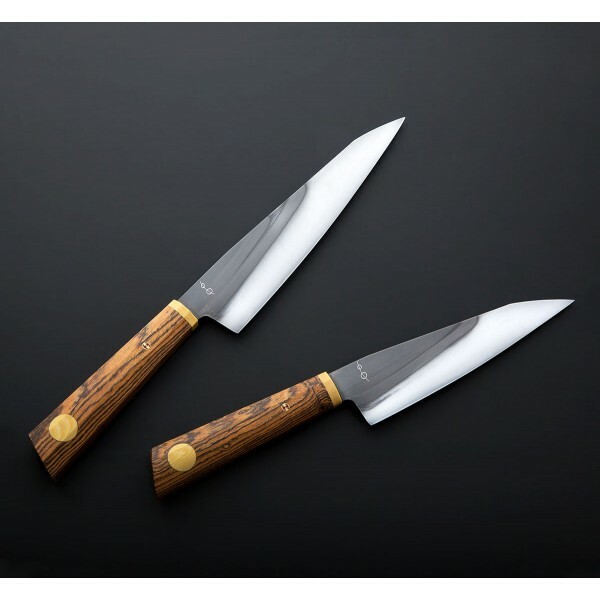 In hidden-tang construction and Don's wonderful wa-style handle rendition, each eye-catching piece of bocote is accented with antique 'ivory' paper micarta inlays and bolsters. 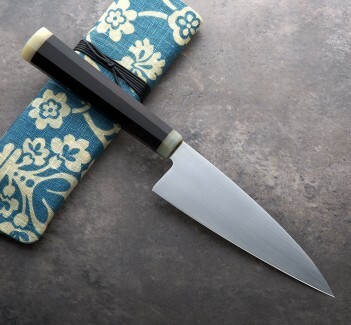 Each knife balances beautifully where the handle meets the blade, and convex geometry with thin, sharp edges make for daily users primed to prepare endless meals and to last lifetimes. Cloth covered protective cases are included. Don Carlos Andrade uses his extensive culinary knowledge and incredible bladesmithing abilities to create tools that encourage friends and family to spend time with one another in the kitchen, preparing meals that satisfy body, mind and soul. 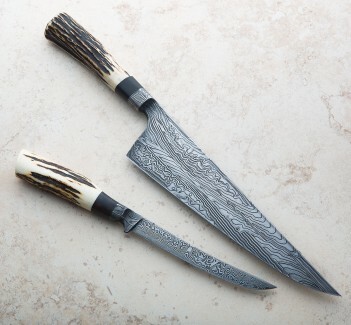 This Couples 'Heart' chef set represents that mission, and represents the finest quality in luxury culinary tools. LARGE / SMALL: Blade: 210mm / 170mm.  Overall length: 365mm / 320mm. Blade width at choil: 2.7mm / 2.8mm. Blade wiidth 1" from tip: 1.6mm / 1.6mm. Blade height at heel: 47mm / 45mm. Weight: 188g / 154g. 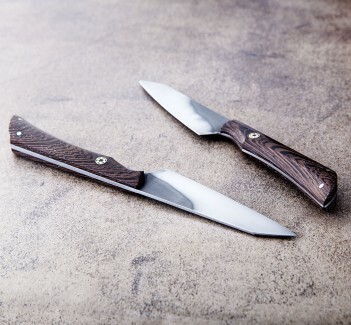 Blades: Differentially heat treated 1095 carbon steel, etched and polished. 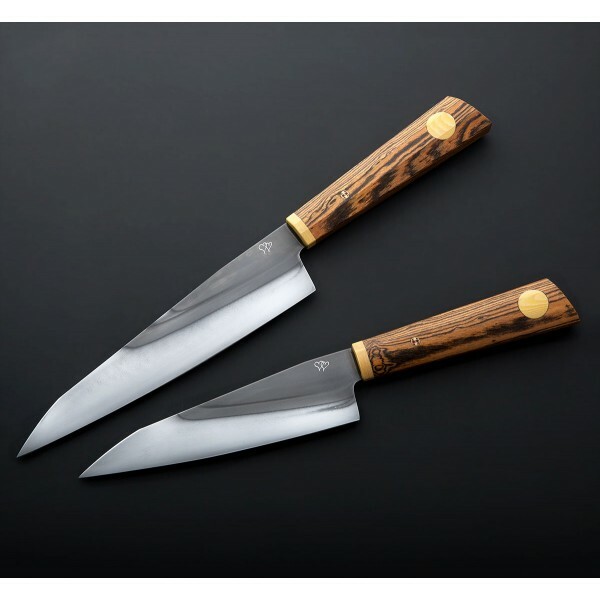 Handles: Bocote with antique ivory paper micarta and mosaic pin.